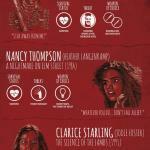 In this horror infographic, we have final girls from horror movies throughout the ages. Each final girl has a survival status, threat (what wants her dead), and weapon of choice. This horror movie final girls list includes Vera Miles, Marilyn Burnes, Jamie Lee Curtis, Sigourney Weaver, Adrienne King, Shelley Duval, Heather Langenkamp, Jodie Foster, Neve Campbell, Naomi Watts, Shauna Macdonald, Sharni Vinson, and Jane Levy. That is a huge list of amazing actresses who defied the laws of horror movies and became the villain’s worst nightmare. Just curious, which final girl is/was your favorite?